Ak-Chin Indian Community and its properties are hosting an array of events for the holiday. Ak-Chin Southern Dunes hosts a four-person scramble starting at 7:30 a.m. on July 4. The event includes 18 holes with cart, buffet, complimentary bottled water and awards for best dressed and most patriotic. Cost is $50 per person plus tax. Register at 520-426-6827. 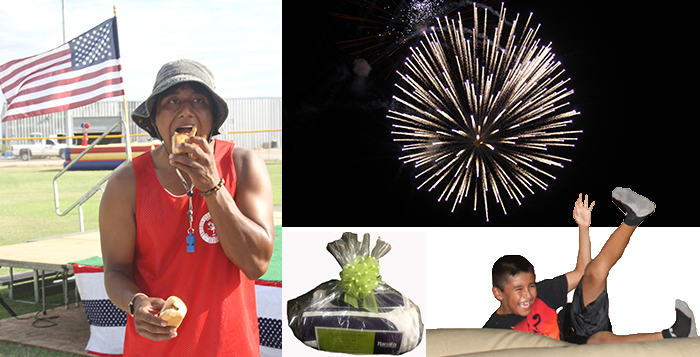 Ak-Chin Parks & Recreation hosts its annual Fourth of July Celebration at the recreation center. There will be pool activities from noon to 4 p.m. Then kids can enjoy the Inflatable Carnival from 4:30 to 8 p.m. There will be a department hotdog eating contest, watermelon eating contest and talent show. The fireworks will begin at dusk. Harrah’s Ak-Chin Casino gets the party started a little early on July 2 with great music from the Marshall Tucker Band starting at 8 p.m. On July 4, the casino will be giving away two free pool towels to Total Rewards members in the Ballroom from 2 to 6 p.m. That evening, Fortunate Son will be in the Lounge. The Buffet will be serving a BBQ-inspired menu. UltraStar Multi-tainment Center at Ak-Chin Circle has an evening of fun planned. Starting at 5 p.m., enjoy the Slip & Slide, splash pad and more water entertainment outside for free. From 5 to 8 p.m. enter to win free movies for a year. The winner will be announced before the Movies Under the Stars presentation of “Transformers 2007” after the fireworks. You must be present to win. There will also be an outdoor BBQ for $16.95/adults and $8.95/kids. The menu includes tri tip, roasted corn, baked beans, BBQ chicken, potato salad, pasta salad, hamburgers, hotdogs, salad and cobbler. Follow the UltraStar events on Facebook at Facebook.com/events/433198793538879.